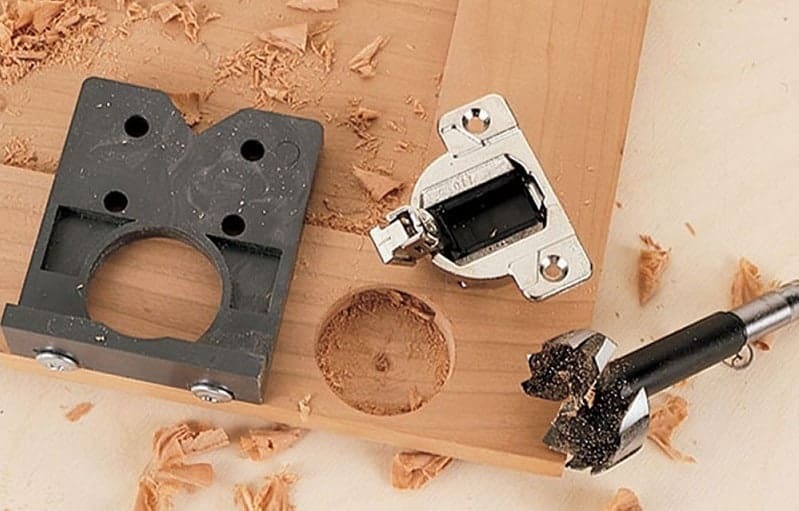 A boring jig kit is an important piece of equipment for woodworkers. 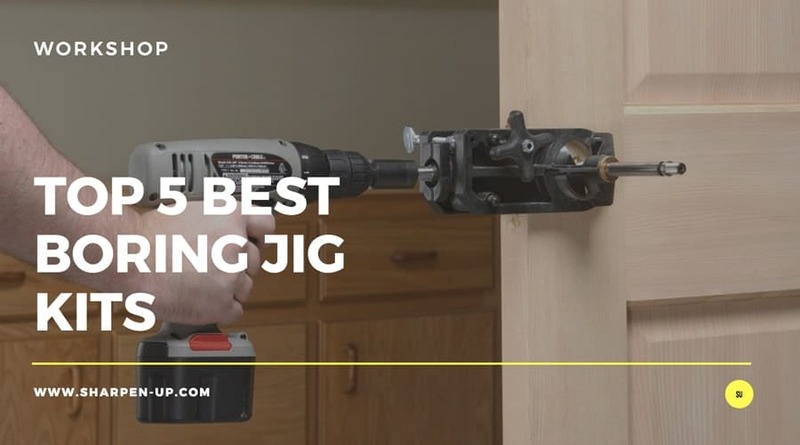 Whether you need to precision bore holes for cabinet hinges, wish to use your power drill to bore holes or merely need to fit a new door lock, the correct boring jig will make simple work of it. However, like most tools there are a wide range of jigs currently on the market. Knowing which one to buy can be confusing. To save you the trouble we have come up with this handy buyer’s guide. Below you find 5 reviews of some of the best boring jigs currently available. For our findings at a glance just head to the table below; for in depth information about each of our top picks, keep on reading. Jig Kit 2-3/8" & 2-3/4"
Okay, we can probably assume that everyone that has reached this page is aware of what a boring jig is. 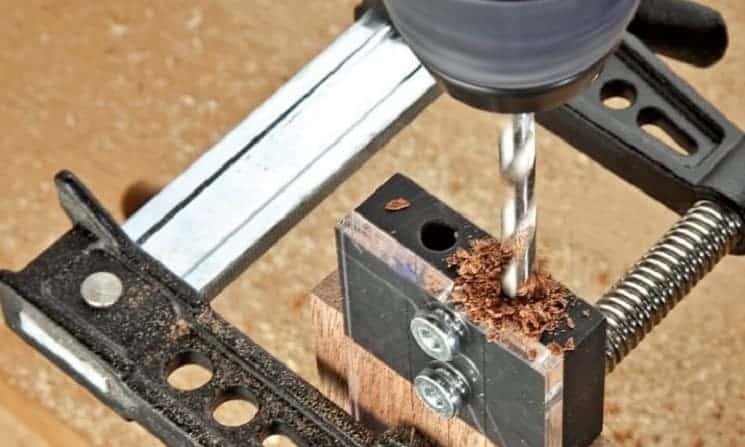 However in an effort to be as thorough as possible a boring jig is a tool that makes the precise (and repeat) drilling of hole centers very easy indeed. A professional boring jig can be seen as a specialized milling machine. It enables tool and die makers to bore holes with a degree of positioning precision that a standalone drill press cannot hope to replicate. There are different types, sizes, and brands of boring jig sets, and one needs to choose the right jig for the job at hand. The correct tool is important because it determines the quality of workmanship and overall finish. Let’s take a look at the different types of boring jig currently available. A standard jig is designed to be used with any hand or floor drill press, enabling the said tool to accurately bore holes using the drilling mechanism. The jig will fasten to the material and allow the user to precision drill (with accurate repeatability) a bore to a set depth. 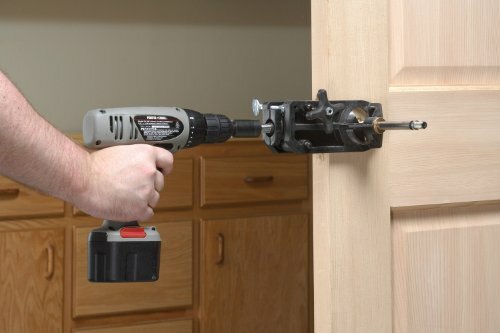 A hinge boring kit is used by woodworkers to precision drill the holes required for attaching door hinges in cabinet making. Normal drilling not only produces standard, or sometimes poor quality finishing, but it may also damage delicate woods that are often used for high quality, ornate cabinets. There is also the issue that some doors will be fitted using European hinges. This requires use of specialist boring jigs that are designed to accommodate different brands of hinges. Very simple, low cost boring jigs are available that allow the user to efficiently cut holes for attaching door locks and handles. 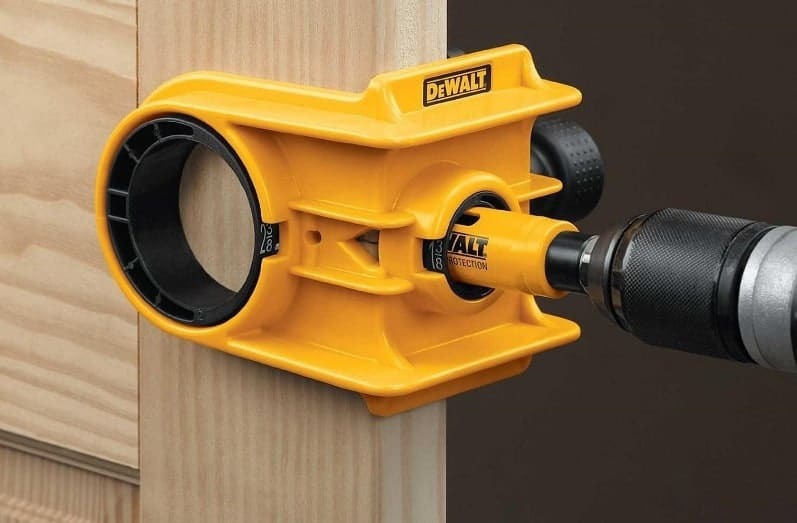 These are used in conjunction with hand power drills and allow for precision cutting of holes that house the lock mechanism. Depending on the type of boring jig kit you need, there are various issues you should consider before you buy. Let’s take a look at some of them now. Once you have decided o the type of boring jig you wish to use, you should check the compatibility of it in line with your other tools. In other words, will it work with your hand or drill press when opting for a standard boring jig. If you are in the market for buying a hinge boring jig, will it be able to cut the holes for a wide range of hinge types? Idealy you should opt for a jig with a 3 spindle head that is compatible with any brand of hinge. Whether it’s a jig for cabinet making or for use by a locksmith the tool should also be compatible with various door thicknesses. The more versatile the boring jig the better. Adjustable stops are an important part of the jig and you will want these to be as accurate and well made as possible. The stops will allow you to set the cutting distance from the door’s edge. In other words the more control you have here the better. The settings should allow for pin-point accuracy and ideally match recommended settings from all known brands of hinges. This is another area where you will want your jig to be as reliable as possible. The way it attaches to the material being is important. The last thing you want is for the jig to come loose half way through drilling. Look for systems with tight clamping bars and easy to use tightening knobs, (these need to be accessible without the need for fiddly operation). Cam lock levers make things easier. Friction pads on the jig also help keep everything in one place for those all important repeat drills. 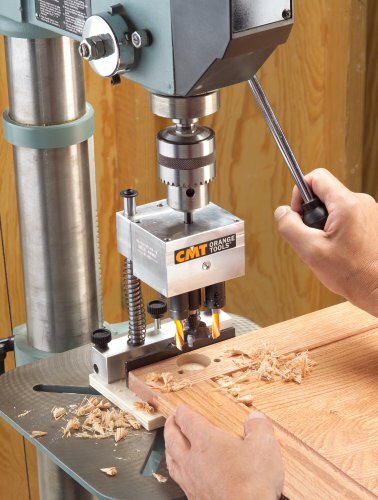 Your jig should be designed to make precision drilling as easy as possible. The above points all help in this regard. However, added features such as V centering grooves to help you line up the drill bit are also worth looking out for. The centreline for your bore should be easy to create and follow. Once the cam levers are locked down and the bore is in place you should be able to begin drilling without any concern that the accuracy of the unit has been compromised. There are boring jig kits that are versatile and can be used to perform different specialized tasks. We will now rate a selection of jigs for performance, cost effectiveness, versatility and overall quality. What follows is a review of 5 of the best boring jig kits in the market today. This a durable, versatile and high-quality boring jig designed and manufactured by Classic Engineering, a reputable manufacturer of quality boring jigs. 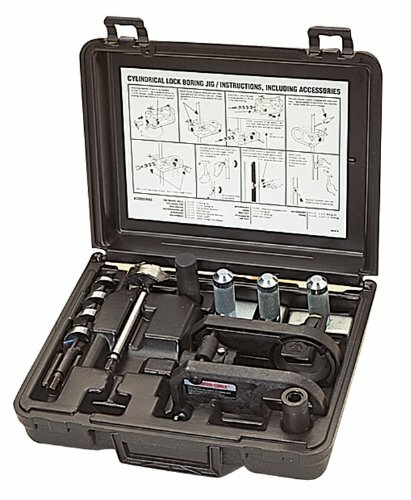 This boring jig kit is designed for professional use, but amateurs can use it with a little guidance using the manual. The fully set-up jig kit measures 13.5 inches in length, while its width and height measurements are 5.4 inches and 10.2 inches respectively. It weighs about 9.2 pounds, and it can therefore be carried around easily. Also, its dimensions show that it is a compact kit that can fit easily into any workspace, including small workspaces around kitchen cabinets. This jig set is shipped in a disassembled state, and the user needs to have basic knowledge of how to assemble the different pieces properly so as to build a working boring jig. Even so, the manufacturers have also considered for first-time users of this kit, and they ship it alongside an in depth instruction manual. This manual provides a simple straightforward step-by-step instructions of how the boring jig kit is to be assembled. Moreover, the manual is full of illustrated how-to instruction guides, and these instructions allows an experienced user to use the boring jig to bore uniquely shaped and designed holes in woods. It also comes with its own well-molded heavy-duty carrying case. It also comes with a 12-months warranty. The jig kit is made from high-quality rust-resistant materials, which ensure that the components are durable and possess high-tensile strength which minimizes the chances of them breaking during use. This also gives the kit a long lifespan. In any boring jig, the quality of the bit determines how efficient the equipment would be. Classic Engineering has not disappointed, and it has manufactured high-quality bits that go along with the boring jig. These bits include the 1-inch spade boring bit, two-and-an-eighth(2-3/8) inch spur bit, and one-and-a-half(1-1/2) inch spur bit. The tips of these bits are made from carbide, a tough material that is quite resistant to wear. This allows the bits to be used for a long period of time without being damaged by wear and tear. The kit also features a basic fixture that supports standard 2-3/4 inches and 2-2/8 inches backset positioning. It also has a 3/8 inch quick-release adapter that allows for easy placement or removal of bits. There is also a 1-1/2 inch reducer ring that is specially designed to used with the 1-1/2 inch carbide-tipped spur bit. These components allow an experienced user to to determine the depth of hole to be bored. 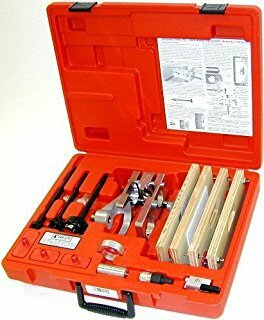 The strike mortise of this jig kit measures 1-3/4 inches by 2-1/4inches, and this size allows the user to create smooth bore holes for almost all kinds of door hinges. The mortise is designed to be held in place by a latch, and this latch mortise is also provided in the jig kit. The kit also features a steel strike marker which allows the user to draw center lines on the workpiece. Made of high-quality rust-resistant materials. Can handle most quality materials. Can bore holes of predetermined depth. Easy-to-use once one understand the assembly and use procedures. Comes with high-quality wear-resistant carbide-tipped bits. Requires the user to be familiarized with its components and assembly procedure. 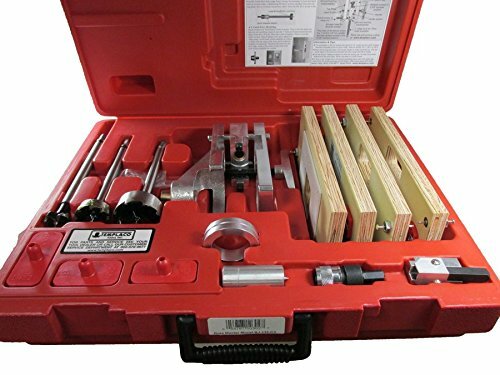 The Classic-Engineering 10800 Boring Jig-kit is a compactly-designed, versatile, durable, and easy-to-use boring jig that allows for drilling of uniquely-sized and patterned holes in all quality of wood materials, as well as other non-wood workpieces. Its cost-performance ratio, long lifespan, portability, and versatile nature make it in our opinion, the best boring jig on the market today. 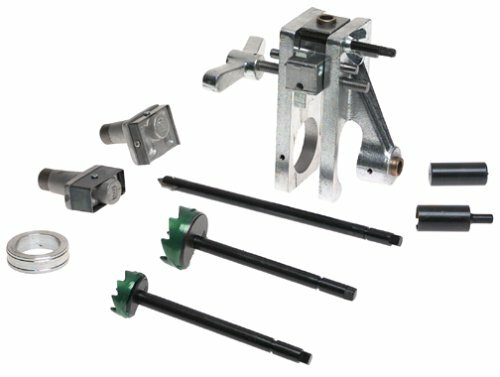 The Deluxe Bore Master Kit is a durable and versatile boring jig designed and manufactured by Templaco, a California-based company. It is designed as a complete (door) lock installation kit. It works best with cylindrical lock-sets. The fully set-up jig kit weighs about 16 pounds, and even though it is heavier than the Classic-Engineering 10800 Boring Jig-Kit, it can still be carried around easily. It also features a compact design which allows the assembled boring jig to fit easily into any workspace, including small workspaces around the house. Just like the 10800, the Deluxe Bore master kit is shipped from the manufacturer with the boring jig components still in their disassembled state. Therefore, the user needs to have the knowledge and skills of how to assemble the different pieces properly before they can begin. This should not be a problem however as the manufacturers provide an easy-to-follow instruction manual. This covers jig assembly and also contains a series of guides on how to get the most of the boring jig kit. This master kit comes with its own well-molded, heavy-duty, and rugged red carrying case which features exceptionally strong latches. 3 carbide-tipped spur bits are provided: a 2-1/8 inch lock spur, a 1-1/2 inch dead bolt, and a 1-inch latch spur bit. Also, like the Classic-Engineering 10800 Boring Jig-Kit, it also features a 1-1/2 inch reducer ring that is specially designed to used with the 1-1/2 inch spur bit. The kit also contains a half-inch hex-drive quick-release bit adapter which facilitates the placement and removal of spur bits. 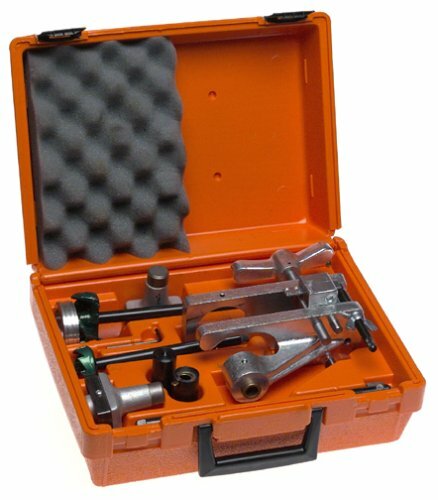 The unique components in this master kit include the quarter-inch radius corner chisel which allows the user to easily work-around cylindrical lock-sets. This chisel is spring-loaded so as to allow for easy squaring-out of mortise corners in hinges and lock-sets. It also has a 1-inch diameter center marker that enables the user to easily mark center lines on the workpiece. This center marker is made from aluminum, but its tip features a steel point. 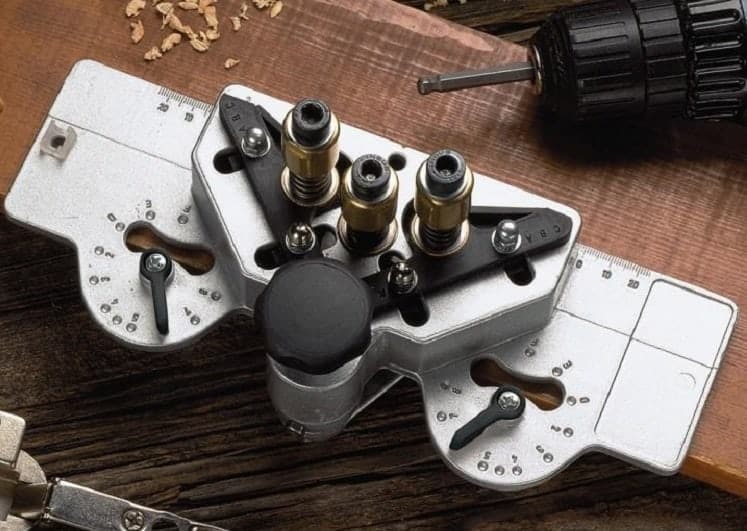 Another unique feature of this boring jig kit is that it has its own router templates. These router templates have been optimized to be used with strike-latch plates, T-strike plates, and the dead bolt template. The drill fixture in this master kit is adjustable, and can be used with materials that are between 1-inch to 2-7/8 inches thick. The drill fixture is also customized to be used by 2-3/4 inch and 2-3/8 inch back-set that comes with the Deluxe Bore kit. Works well with cylindrical lock-sets. Comes with its own router templates. Comes with high-quality wear-resistant bits. The Templaco BJ-115C3 Deluxe-Bore Master Kit is an American-made, compactly-designed high-quality boring jig. It is versatile, durable, and easy-to-use; and also features its own router templates. Overall a highly recommended jig kit. This Eco-drill is a durable and high-quality heavy-duty boring jig designed and manufactured by Blum. The fully set-up jig kit measures 9.4 inches in length, while its width and height measurements are 7 inches and 8 inches respectively. It weighs about 4.4 pounds, making it a lightweight portable boring jig. The dimensions reveal that it is a compact kit that can fit easily into any workspace where boring may be required. 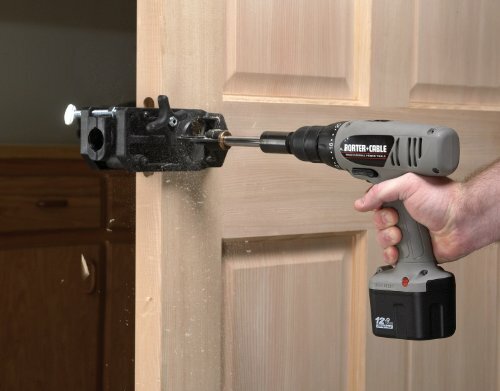 The boring jig is designed to be used by an electrically-powered hand drill. The minimum voltage required to run this hand drill is 14 volts. This kit comes with 3 bits; one 35mm bit and two 8mm bits. These drill bits are meant to be driven separately, and as such, each bit can be retracted individually. The retraction process is automated. The tips of these bits are hardened so that they are resistant to wear. This allows the bits to be used for a long period of time without being damaged by wear and tear. 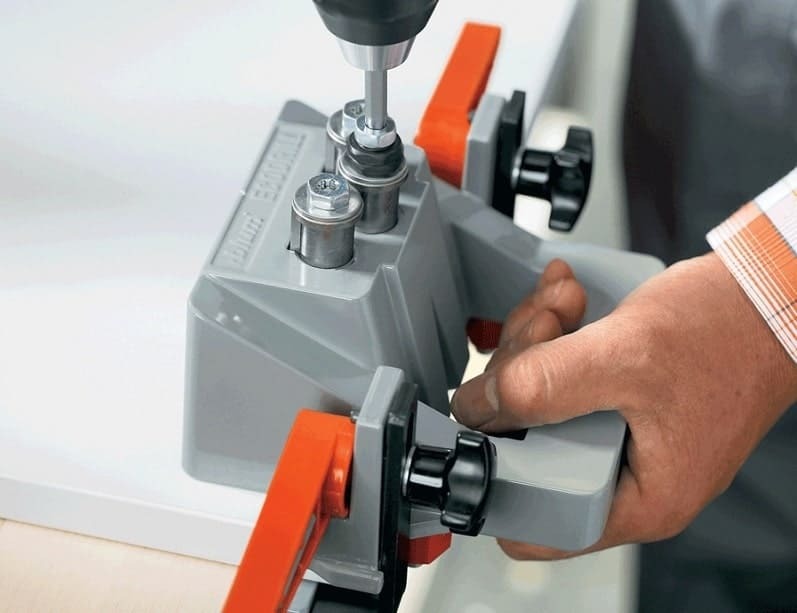 Just like the Templaco, the Blum Eco-drill boring jig is designed to work with materials of varying thickness, (it does in fact support a maximum door thickness of 44 mm). 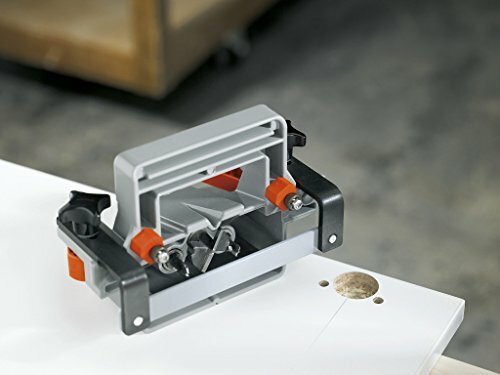 Unlike either the Classic-Engineering 10800 boring jig or the Deluxe Bore master kit; the Blum Eco-drill boring jig is shipped in a partially-assembled state. That being said, the Blum ships with an easy-to-follow instruction manual with illustrated how-to guides. The Blum Eco-drill jig set is made from high-quality rust-resistant materials, which ensure that its components are durable. Its parts also have a high-tensile strength which minimizes the chances of them breaking during use. This also gives the kit a long lifespan. Relatively expensive while offering very little to distinguish the kit from the others in our top 5. The Blum M31.1000 Eco-drill is a compactly-designed, portable, and high-quality heavy-duty boring jig. This electrically-powered boring jig is versatile, durable, and easy-to-use; and comes in a partially ready-to-use state. The Porter-Cable 511 Cylindrical-Lock is a high-quality, electrically-powered boring jig designed and manufactured by Porter Cable. It is designed for easy installation of cylindrical door locks. The fully set-up jig kit measures 12.9 inches in length, while its width and height measurements are 4.4 inches and 10.8 inches respectively. It weighs about 8 pounds, and this makes it a lightweight enough to be thrown in the tool box and taken from job to job. 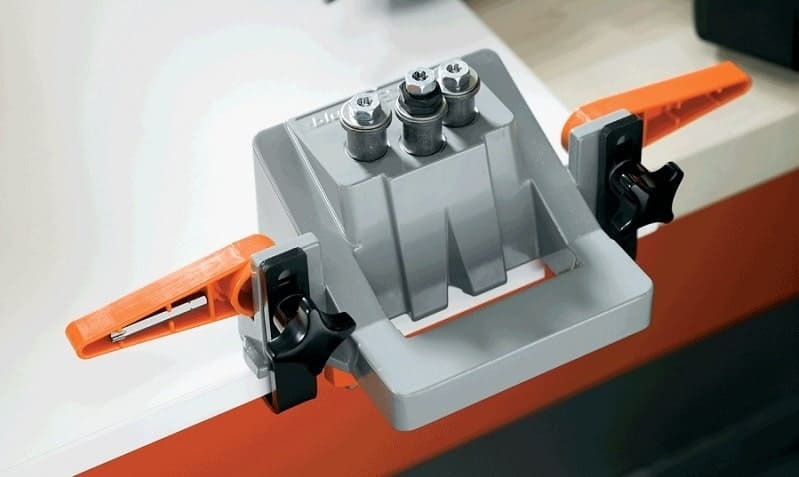 These dimensions reveal that the Portable-Cable 511 is larger than its electrically-powered counterpart, the Blum M31.1000 Eco-drill boring jig. Like the other kits in our top 5 the user needs be skilled enough to assemble the different pieces properly befre they can get to work. (An easy-to-follow instruction manual is provided of course). 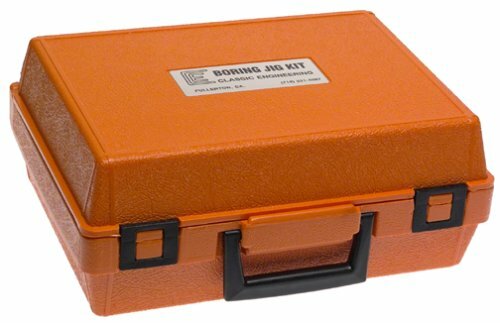 The Porter-Cable boring jig comes with its own well-molded, heavy-duty, and difficult-to-break carrying case. This boring jig kit comes with a 1-inch boring bit and another 2-1/8 bit. It also features a latch mortiser, a striker locator, and an optimized quick-change drill adapter. The Porter-Cable 511 also features unique components such as the full-up strike mortiser, and a maximum security mortiser. These components allows it to work well with doors of varying thickness so long as the door thickness does not exceed 2-1/8 inches. This jig kit is customized to be used by either a 2-3/4 inch or a 2-3/8 inch back-set. This is because its framework allows the bits to easily locate position when using either of the back-sets. 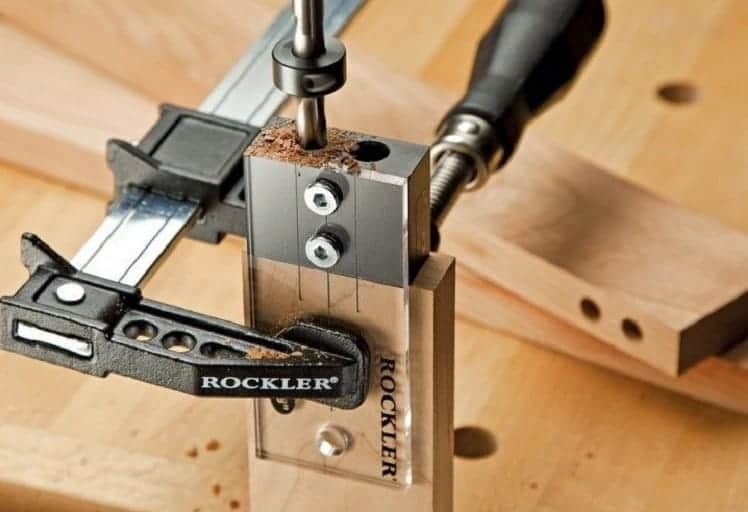 The most unique feature of the Porter-Cable 511 Cylindrical-Lock Boring Jig is its ability to drill all the holes in the workpiece in one (single) set-up. This reduces the time needed to make the holes, and for this reason it is recommended that the user pays close attention to how the holes have been marked so that everything correctly aligns. To simplify this process, the jig comes with a strike locater. 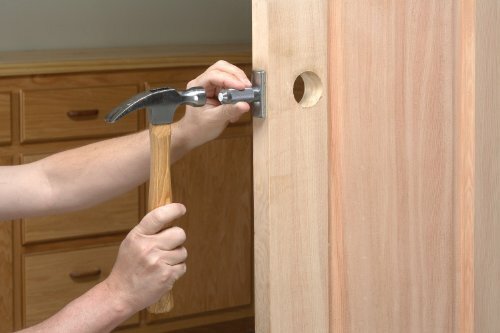 This locater helps ensure that the jamb mortise is placed accurately. It also helps the user see whether the not-yet-bored holes will align as they should. Has received some less than positive reviews surroundig ease of use and overall performance, (you can read some of them here). 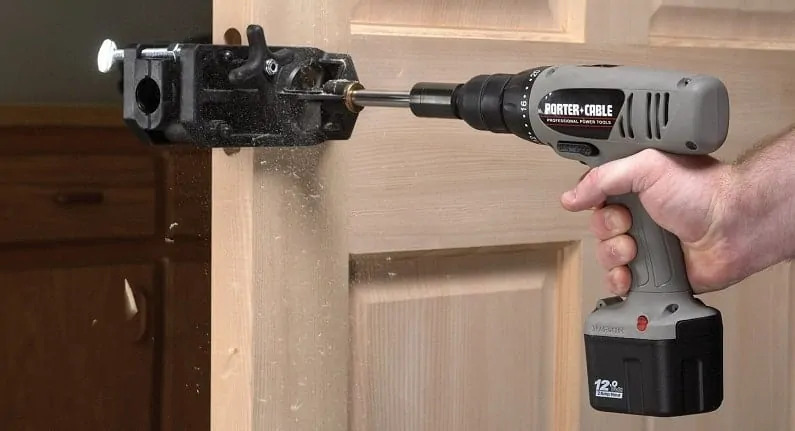 Porter-Cable 511 Cylindrical-Lock is a portable, high-quality electrically-powered boring jig purposely designed for easy installation of cylindrical door locks. However, some of the negative feedback it has gained means it falls short of being are most recommended boring jig. 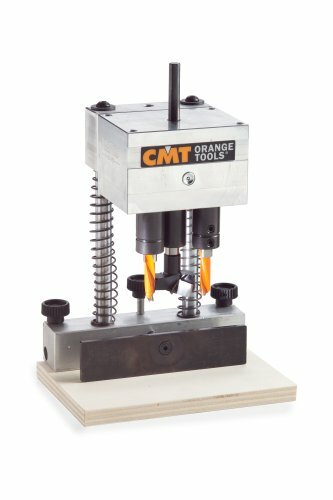 The CMT333-03 Universal Hinge Boring System is a uniquely-designed heavy-duty boring jig that features a universal modular base that allows for the installation of 5 different types of boring heads. It is also constructed to be used with either a stationary or an all-hand drill press. It is designed and manufactured by CMT. The fully set-up jig kit measures 4 inches in length, while its width and height measurements are 4 inches and 6 inches respectively. It weighs about 6.9 pounds. Its dimensions make it the smallest boring jig among the reviewed boring jigs. Also, its dimensions and compact design allow it to fit easily into any workspace. This boring jig is shipped in an assembled state, and it comes equipped with a standard Blum-Salice boring head. It is also shipped with a 35mm boring bit. There are no other boring heads included in the accessories, and the user must therefore purchase the other types of boring heads supported by this boring jig. This also applies to the 8mm drill bits which CMT sells as separate accessories. The most unique feature of this boring jig is that it incorporates a 3 spindle-head into its well-built solid construction. Because it comes in a ready-to-use state, the user needs only to have the basic knowledge of how to change the boring heads, as well as installing an 8mm bit. To facilitate this, ships this boring jig along with an easy-to-follow instruction manual. This manual provides a simple straightforward step-by-step instructions and work-around guides of how to get the most of this boring jig kit. 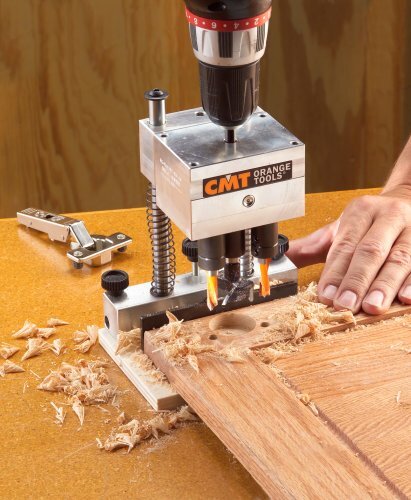 Just like the Blum Eco-Drill boring jig, the CMT 333-03 can work with a hand drill, but unlike the Blum Eco-drill, it does not require electricity to operate. As mentioned earlier, it comes with only one 35mm bit, but the user can also install 8mm bits. The tips of these bits need to be hardened so that they are resistant to wear. The 35mm bit is properly hardened, and this allows it to be used for a long period of time without being damaged by wear and tear. Just like the other four boring jigs, the CMT 333-03 is designed to work with materials of varying thickness. It also supports boring depth adjustment. The CMT333-03 Universal Hinge Boring System is made from high-quality rust-resistant materials, which ensure that its components are durable. Its parts also have a high-tensile strength which minimizes their chances of breaking during use. This also gives the kit a long lifespan. Comes with very little accessories. 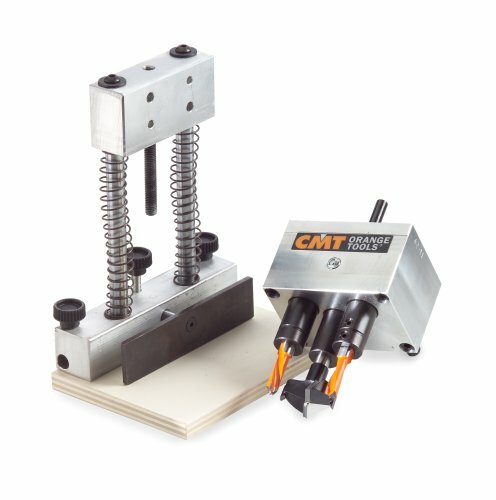 CMT333-03 Universal Hinge Boring System is a compactly-designed, portable, and high-quality heavy-duty boring jig that features a universal modular base that allows it to work with both stationary and all-hand drill presses.